As the NoMad neighborhood continues its revitalization, the demand for quality office space continues to grow, and the many amenities NoMad has to offer is now attracting more new high-quality development. On January 17th, the official groundbreaking ceremony was held for an impressive new 22-story office tower at the corner of 31st Street and Broadway. The building is being developed by GDS Development and designed by the noted architectural firm of Skidmore, Owings & Merrill (SOM). 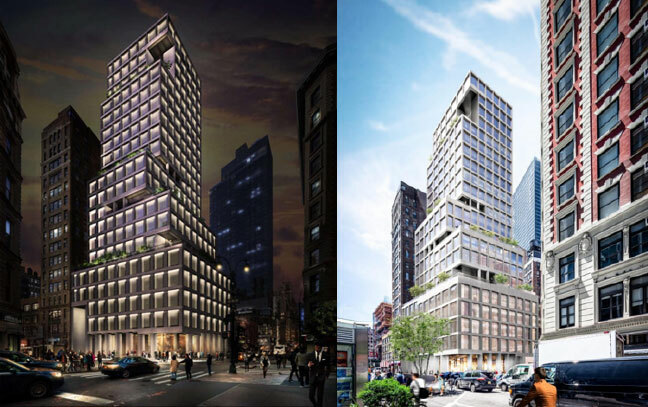 Yimby recently published new renderings from the architects of the anticipated tower, which is to be designed with multiple open terraces and an attractive glowing façade. When completed, the structure is expected to include 170,000 square feet of office space from the second floor upward. The ground level is reportedly designated for a lobby and restaurant. According to its developers 1241 Broadway will differentiate itself in being a boutique, Class-A office building, still much in demand in New York City. The new SOM office tower joins a collection of new construction projects throughout NoMad, adding millions of square feet of both office and residential space to the neighborhood. Recently, the Bjarke Ingels-designed office tower a short distance away, at 29th Street and Fifth Avenue, nearly doubled its original proposed height during the planning stage.